The pineapple pictured on the right is about 3 years old, and is approximately 2.5 feet tall. 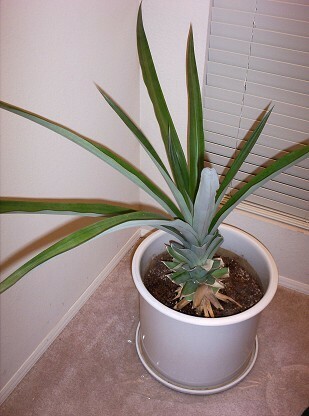 It was grown from a grocery store pineapple top, and has always been kept indoors as a house plant. It is situated in the North East corner of the house near North and East facing windows and therefore gets a far amount of direct sun. This plant has not produced any fruit yet, so I am considering using the apple technique (see below) to encourage it. Pineapples make great house plants. They do well with only several hours of direct sun each day and require very little water. They will produce fruit when grown this way but it is usually sour. Pleasant tasting pineapple can only be produced in the kind of ideal conditions in which they are grown commercially. In Phoenix, pineapples will also grow outside but need protection from the afternoon sun and are not too fond of our alkaline soil. Furthermore, agaves and yuccas have a look very similar to the pineapple plant and are much better adapted to this climate, so there is little motivation for growing pineapple outside. The little sour pineapple fruits one gets, when growing them indoors, are good for mixing into smoothies with other fruits and lots of sugar. They are generally not suitable for eating straight, but the sight of a fruiting pineapple in your living room is very interesting. A pineapple over one year old can be encouraged to flower by enclosing it in a plastic bag with apple slices. The bag should only be loosely placed over the pineapple so that there is still some outside air circulation. Leave the plant like this for a week. The pineapple should flower within several months. Caution, putting the plant under a plastic bag in full sun can cook it, so it is better to move the plant to light shade for this procedure. Pineapples planted outside in Phoenix do better with direct morning sun and afternoon shade, so Eastern exposure is recommended. In the house, they will do well with only several hours of direct sun each day, but should be given as much direct sun as possible. Pineapples planted outside in Phoenix will only need protection on unusually cold winter nights because they are hardy to 28 degrees Fahrenheit. Simply covering them on nights close to the freezing point should be sufficient, but a hard freeze will necessitate a light bulb or another source of supplemental heat. Dig a hole at least twice the size of the rootball. At a minimum, make the hole 2 feet in diameter and 1.5 feet deep. Work in a 50/50 mix of compost to soil. Be sure to mix the compost and soil as thoroughly as possible. It also is a good idea to finish with the hole an inch or two recessed so that a watering basin is formed. Pineapples can grow to be very large so they should be planted in the largest pot that can be safely moved around. A light, porous soil is best because it will keep the roots sufficiently moist without keeping them too wet, and will allow oxygen to penetrate the soil. High quality potting soils are usually light like this, and are better for a pineapple than cactus mix or sand because they are richer. For as lush as they look pineapples like to be kept very dry, almost as dry as a cactus. Only water when the soil is completely dry several inches below the surface. For outdoor pineapples basin or flood irrigation is recommended because it helps keep the salt in our salty water from accumulating around the roots. Furthermore, deep watering will encourage the plant to develop deeper roots, making the plant tougher when the weather gets hot and dry. Indoor pineapples should be watered until water appears in the saucer. Pineapples do well with very little fertilizer. One application of fertilizer a year, during summer, is sufficient. Use a low nitrogen, water soluble fertilizer to avoid burning the plant. Older leaves can be cut off near the stalk to improve the plants attractiveness. One of the most attractive features of pineapples is that you can grow one from a grocery store fruit. This makes a good project for kids as well as for adults. The first step is to cut off the pineapple leaves just below where they are attached to the fruit. A nice platform for standing the stalk will be created by the thin section of fruit attached to it. Eat the rest of the fruit, because the stalk and leaves are going to become your new plant. Rooting hormone can also be applied to the wound, at the time cutting, to speed up later root development. Let the wound dry out for several days. Drying the wound out is important to keep it from rotting. When the cut area has hardened off, plant the stalk just a couple of inches deep in light potting soil, being sure to cover up the fruit and an inch of the stalk. Do not water the soil directly, instead use a spray bottle to mist the leaves. Pineapples have the interesting ability to absorb moisture through their leaves. The soil will get a little bit damp from this spraying as well, which is good. Water the pineapple like this ranging in frequency from every day to several times a week, depending upon the ambient humidity and how much sun the plant is getting. Within a month the plant should root and start to grow. An alternative method to misting the pineapple utilizes a plastic cover to maintain moisture around the plant. This method can be found in the links provided below. Pineapples have no significant pests in Arizona.